Ski-in Ski-out 7 Bedroom Estate is Pure Beaver Creek Luxury! · Included in rental is a light clean 6 days a week excluding Holidays. A full housekeeping service can be provided for an additional fee. 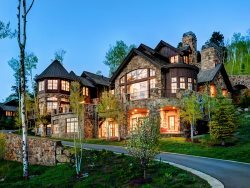 This Beaver Creek ski estate is 14,000 square feet of pure luxury! This is an incredible property that features every comfort expected in the grandest of mountain residences. In 2010, this home was rated one of the top 10 ski homes in the USA by CNBC. Ski in, ski out via your private bridge in Beaver Creek in the exclusive gated community of Arrowhead. An elevator spanning the four floors will deliver you from the ski room to the private and serene spa, complete with stone grotto and an indoor waterfall cascading over a hidden cave. Whether you are a celebrity or not, this estate provides the ultimate seclusion. Spectacular panoramic mountain views from an exceptional Great Room. Spectacular outdoor living spaces with heated stone terraces, water features, fireplace, fire pit, and private hot tub offers a more invite a life of both luxury both outside and within this exquisite masterpiece. An elegant entryway and European styled motor court grandly welcomes guests to this Tuscan Chateau. 7 spacious bedroom suites including 3 masters, a huge laundry room, a bright and welcoming work out room, and so much more! Bunk bed area- Two sets of twin bunks so this area is a cool alcove off the hallway on the lower level, some kids think it's like a FORT. 4 NTS during the entire year and 7 NTS for Holidays. Check-in is strictly 4:00 pm and check-out is 10:00 am unless you have made other arrangements with us. Please take this into consideration as you make your flight and transportation arrangements. Early check in (1:00 pm) and late check-out (1:00 pm) are available (in most situations with the exception of peak holiday times), and can be purchased for an additional fee. Please contact Mike McClinton at [email protected] if you have questions or would like to arrange. Also, when you have made your transportation arrangements, please contact Mike with your estimated time of arrival.